Hooray... did you hear about the new iPad 2 coming out?! Granted my husband and I are tech nerds and exchange text back and forth about stuff like this -- it looks pretty dang sweet. Of course it is faster, thinner, and has even more features (like a camera) than before! It comes out March 11. What are you thoughts about iPads and tablets? I'm super curious because I've joked around with a few of my doubting friends that I think most people will have one in the next five to ten years, but what do you think? Ps. If you use pinterest ... it pretty much rocks on the iPad. When I'm up feeding the baby at night, sometimes I pin away, follow me here if you want. I also love flipboard! What are your favorite apps, shout 'em out. Speaking as a student, I have no reason to own an ipad or anything similar. I love my itouch and I have a macbook so the ipad just seems like a big itouch that can't replace a regular laptop, thus unnecessary. I don't see tablets becoming a household staple any time soon. I am a tech gadget geek too! I love the new iPad2. I'm so happy to see a white one. it will match all the other white gadgets I already have. I have a new small biz and I can't wait to use it for that. I want one so bad. My birthday is march 12 and I'm hoping to get one as a gift. Fingers crossed. i'm also a student, and while i can see how the ipad can be used for schoolwork, i think if i had one, i wouldn't use it for that. i do think the ipad will only continue to grow in the market, though. looking back, when the ipod first came out, people didn't think it would catch on as much as it has now either. "who would pay $300 for an ipod when you get a CD player for $30? who needs all those gigs anyways?" that being said, the ipad is still SUPER EXPENSIVE. by the time i can afford to buy one (maybe by graduation? ;]), i feel like the price will come down a little bit, and if not, there will definitely be more features added on to make it worth it. I just have no desire to have one. I still don't even have an iphone. No need for the internet for me. If I do, I just bring my macbook. So exciting! Thanks Rachel! I've been holding out, and it looks like it was worth the wait. I'm pretty harsh on the whole ipad thing. I think it's a novelty, to be honest. I would much rather spend my money on the MacBook Air...and then have a pocket gadget, like the ipod touch (I love mine!) or the iphone. 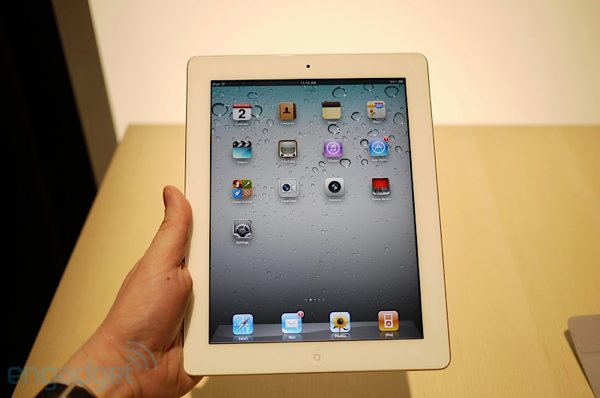 The ipads are so cumbersome looking...and imagine if you drop that thing...eeks! So i'm a huge ipad lover! I was wondering how you use pinterest on the ipad. i don't see an app specifically for it? am i missing something or do you just go onto the web and look at it there. i just wish you could use the pinterest functions on the ipad -- please share if i have no idea what i'm doing. thanks so much. I always wait for 2nd generation Apple products. I really want one now! I love pinterest too. There's so much inspiration there. I want one so bad, I can taste it. First, my iPad has been dropped a few times by my young sons - survived just fine! I used to be a total tech geek, but when I left work to stay home with my boys, I couldn't justify 'keeping up'. When I get a new phone my only requirement is that it be one that can survive lots of drops. Was do a little search for using Pinterest with the iPad 2 and came across your blog. I have the iPad app for Pinterest but was wondering it there was a way to "pin" like you would on a computer (when you come across something and add it to your board) I am not very tech savvy but am able to follow instructions. Thanks and I like the blog and know follow.